This was our second trip with an Island Windjammers ship. In December 2014 we enjoyed our time on the Sagitta so much that we signed up for a January 2016 week on the Vela without hesitation. 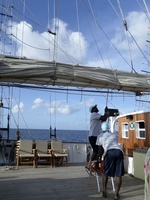 The Vela has been newly refitted and we were aboard her on her third week of carrying passengers. One can see the dedication that has gone into making her a worthy addition to the Island Windjammers fleet. 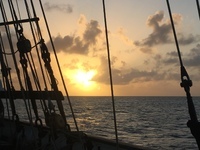 Itinerary: Initially the Vela was supposed to sail to the French West Indies, but due to the prevailing high winds the itinerary had to be changed to St. Vincent and the Grenadine Islands. We appreciated having advance warning about this change, but also knew from past experience that island visits need to be flexible and one doesn&apos;t always know in advance. We were skeptical but as we hadn&apos;t had our hearts set on a particular destination we were open to this new option and we definitely did not regret exploring this area. For a detailed description of this itinerary check out the reviews for the Diamant, as she regularly sails this section of the Caribbean and I would only be duplicating the well-written and thorough review of the unspoiled Grenadines I read there. The snorkeling, empty beaches, the water, the rough hills, the small towns - these are all things that we had not seen in our previous visits to the Caribbean and we highly recommend this area. The crew of the Vela made sure we had daily excursions and were brought by dinghy to island towns, beaches and snorkeling areas which most of the passengers took advantage of. The passengers who stayed on board tended to be those who were a little more limited physically. One does need some flexibility to climb up and down the gangway and aboard the dinghies, but one certainly doesn&apos;t need to be a teenager to do so. We were permitted to jump from the sides of the ship to our hearts&apos; delight, and Captain Nervo even put up a rope swing for all to enjoy. The Vela would usually anchor at night, we did not dock at any piers while on this cruise. Attire/items needed for the trip: The overall vibe of the ship is casual and during the day bathing suits, shorts, and cover-ups were all that was needed. Evenings usually found us showered and a bit more presentable. Shoes are optional onboard, but I would definitely recommend a pair of good sandals or sneakers for island walking/hiking. Also bring a backpack for those excursions. And hats! The Caribbean sun can quickly burn your winter-pale skin. Sometimes you get lucky and can find sunscreen and/or bug spray left by previous passengers in the salon. We did not have a problem with insects biting us on this trip, but it&apos;s good to be prepared for some beach trips. Be sure to bring your own beach towels or purchase an Island Windjammers towel from the ship store. I would recommend a quick-drying towel meant for camping or even a yoga towel. Very practical collapsible water bottles/pouches are left as a gift when one first arrives in the cabin. They have a hook on them and we would attach them to our backpacks for shore excursions, which means you don&apos;t have to bring along any water bottles (like we did for our first trip aboard the Sagitta!). The passengers: Some of us were couples, three traveled as a single. We had one family of three onboard. One of the couples was on their honey-moon, others have been married for years. I mention this to show the variety of passengers who still manage to have a very nice time together. We even had a Londoner onboard. Food: It is so nice to not have to cook a single meal, plan a meal, or wash the dishes. The meals were always on-time and well-done and fresh ingredients were incorporated. Appetizers at Happy Hour were always plentiful and beverages were always accessible. Local beers, wine, soda selections were in a cooler. Large dispensing coolers of Iced Tea and Ice Water were also always fully filled. You won&apos;t go hungry on this ship, but you also won&apos;t be over-stuffed. Portions were just right and service in the salon was done well. The two stewards were always on the ball. Asking for seconds or smaller portions was not a problem. The Ship - three masts and many sails. The Vela can run on wind-power alone and several times she did. No engines. It was a trip back in time. I am prone to sea-sickness but by taking the medication offered on board (right next to the water station) well in advance of any turbulence, I didn&apos;t feel sick at any time while onboard. The crew will warn you when some rocking and rolling is expected and, with that in mind, I was always well prepared. I also occasionally wore the pressure point wrist bands. Many of our 16 passengers wore the &apos;patch&apos; but as the week wore on some reported side-effects such as &apos;dry-mouth&apos; and blurred vision which made me glad I relied on the occasional pill. My point is, one can go on this cruise and not feel ill when the seas get a little rocky. Deck chairs and lounge chaises are provided and shaded when not underway. The salon has four booths in which 6-8 people can sit for meals, or card playing, or chatting. All meals were eaten in this area. A bell summoned us to the salon for meals and story time. Breakfast was at 8:00 am. Lunch at noon or 12:30 pm. Snacks and Rum Punch were offered at 5:00 pm. Dinner was usually at 7:30pm. Each morning after breakfast the whiteboard in the salon would list the day&apos;s activity options and schedule (not a rigorous time schedule by any means) and the Ops Manager would be available for questions and planning. This was not a party-ship experience. Most evenings were spent chatting on the deck under the stars or taking a launch in to a small island bar. One goes into these cruises meeting strangers and one disembarks as friends. With some one remains in touch and others remain vacation memories. There is a sense of togetherness while onboard and groups are variable and get together for different shore excursions or deck activities. We have fond memories of our time aboard the Vela and in today&apos;s age of speed and instant communication, the Vela offers a slower pace. It is a week away from wifi and &apos;the real world&apos; but the truth is one can usually find wifi in the beach bars along the islands. But don&apos;t sit there for too long checking messages and emails - you&apos;ll miss out on the island&apos;s offerings. ******** in case you have questions about getting there: Traveling to Marigot Bay (Embarkation Port): This in itself was an adventure. We flew from Boston via Miami to St. Lucia. The main airport is in the south east corner of the island, but Marigot Bay (Cappella) is in the north west part of the island. We had hired a taxi/driver in advance of arriving and the hour plus long ride was not for the faint-hearted. Tail-gating, windy roads, unattended brush fires along the side (!!! 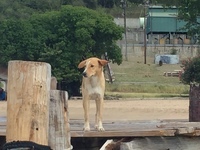 ), going from shore line into and across the mountain region through rainforest type areas, goats and stray dogs can all be seen along the way. I had to just trust that our driver had it all under control, but as a well-practiced backseat driver this was not easy. The Vela was leaving on Sunday, January 3rd and we arrived at Marigot Bay on January 1 as we did not want to risk missing her departure due to cancelled flights or bad New England weather. We stayed in the Marigot Bay Beach Resort for those two nights and be prepared for this very expensive area. We arrived by taxi at the end of the road and a launch boat took us (and our luggage) the rest of the way to the hotel area. Yes, there was no road to the hotel! The restaurant by the hotel is Doolittle&apos;s but one could also take the hotel launches back to the road&apos;s end. There is a small supermarket there which also serves the yachts and sailboats which arrive here. Several small (and quite good) restaurants can be found within walking distance. Eastern Caribbean Dollars are used here, and unlike other areas of the Caribbean we found that US dollars weren&apos;t really accepted. Meals and groceries were not cheap. There is a small beach and some hiking trails in this bay and one can enjoy watching the constant traffic of sailing vessels and a few yachts. One can get good wifi at the bayfront cafes. The wifi at the hotel was sketchy but did the trick. Bring adapters for your electronic devices as St. Lucia is not compatible with USA plugs. There are also some other towns close-by to the embarkation port where one can stay and then take a taxi the morning of the departure date (Rodney Bay or some near-by luxury resorts). Deckhands getting ready to hoist the sails. The Vela in the bay at Youngs Island. Sunset as seen from the Vela. 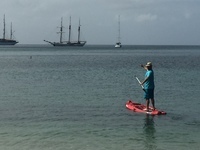 Stand up paddle boards as well as rafts were provided by the ship. This was our second trip with an Island Windjammers ship. In December 2014 we enjoyed our time on the Sagitta so much that we signed up for a January 2016 week on the Vela without hesitation. The Vela has been newly refitted and we were aboard her on her third week of carrying passengers. One can see the dedication that has gone into making her a worthy addition to the Island Windjammers fleet. Itinerary: Initially the Vela was supposed to sail to the French West Indies, but due to the prevailing high winds the itinerary had to be changed to St. Vincent and the Grenadine Islands. We appreciated having advance warning about this change, but also knew from past experience that island visits need to be flexible and one doesn&apos;t always know in advance. We were skeptical but as we hadn&apos;t had our hearts set on a particular destination we were open to this new option and we definitely did not regret exploring this area. For a detailed description of this itinerary check out the reviews for the Diamant, as she regularly sails this section of the Caribbean and I would only be duplicating the well-written and thorough review of the unspoiled Grenadines I read there. The snorkeling, empty beaches, the water, the rough hills, the small towns - these are all things that we had not seen in our previous visits to the Caribbean and we highly recommend this area. The crew of the Vela made sure we had daily excursions and were brought by dinghy to island towns, beaches and snorkeling areas which most of the passengers took advantage of. The passengers who stayed on board tended to be those who were a little more limited physically. One does need some flexibility to climb up and down the gangway and aboard the dinghies, but one certainly doesn&apos;t need to be a teenager to do so. We were permitted to jump from the sides of the ship to our hearts&apos; delight, and Captain Nervo even put up a rope swing for all to enjoy. The Vela would usually anchor at night, we did not dock at any piers while on this cruise. Attire/items needed for the trip: The overall vibe of the ship is casual and during the day bathing suits, shorts, and cover-ups were all that was needed. Evenings usually found us showered and a bit more presentable. Shoes are optional onboard, but I would definitely recommend a pair of good sandals or sneakers for island walking/hiking. Also bring a backpack for those excursions. And hats! The Caribbean sun can quickly burn your winter-pale skin. Sometimes you get lucky and can find sunscreen and/or bug spray left by previous passengers in the salon. We did not have a problem with insects biting us on this trip, but it&apos;s good to be prepared for some beach trips. Be sure to bring your own beach towels or purchase an Island Windjammers towel from the ship store. I would recommend a quick-drying towel meant for camping or even a yoga towel. Very practical collapsible water bottles/pouches are left as a gift when one first arrives in the cabin. They have a hook on them and we would attach them to our backpacks for shore excursions, which means you don&apos;t have to bring along any water bottles (like we did for our first trip aboard the Sagitta!). The passengers: Some of us were couples, three traveled as a single. We had one family of three onboard. One of the couples was on their honey-moon, others have been married for years. I mention this to show the variety of passengers who still manage to have a very nice time together. We even had a Londoner onboard. Food: It is so nice to not have to cook a single meal, plan a meal, or wash the dishes. The meals were always on-time and well-done and fresh ingredients were incorporated. Appetizers at Happy Hour were always plentiful and beverages were always accessible. Local beers, wine, soda selections were in a cooler. Large dispensing coolers of Iced Tea and Ice Water were also always fully filled. You won&apos;t go hungry on this ship, but you also won&apos;t be over-stuffed. Portions were just right and service in the salon was done well. The two stewards were always on the ball. Asking for seconds or smaller portions was not a problem. The Ship - three masts and many sails. The Vela can run on wind-power alone and several times she did. No engines. It was a trip back in time. I am prone to sea-sickness but by taking the medication offered on board (right next to the water station) well in advance of any turbulence, I didn&apos;t feel sick at any time while onboard. The crew will warn you when some rocking and rolling is expected and, with that in mind, I was always well prepared. I also occasionally wore the pressure point wrist bands. Many of our 16 passengers wore the &apos;patch&apos; but as the week wore on some reported side-effects such as &apos;dry-mouth&apos; and blurred vision which made me glad I relied on the occasional pill. My point is, one can go on this cruise and not feel ill when the seas get a little rocky. Deck chairs and lounge chaises are provided and shaded when not underway. The salon has four booths in which 6-8 people can sit for meals, or card playing, or chatting. All meals were eaten in this area. A bell summoned us to the salon for meals and story time. Breakfast was at 8:00 am. Lunch at noon or 12:30 pm. Snacks and Rum Punch were offered at 5:00 pm. Dinner was usually at 7:30pm. 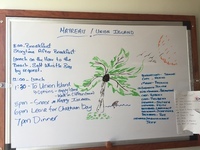 Each morning after breakfast the whiteboard in the salon would list the day&apos;s activity options and schedule (not a rigorous time schedule by any means) and the Ops Manager would be available for questions and planning. This was not a party-ship experience. 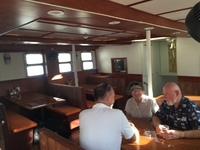 Most evenings were spent chatting on the deck under the stars or taking a launch in to a small island bar. One goes into these cruises meeting strangers and one disembarks as friends. With some one remains in touch and others remain vacation memories. There is a sense of togetherness while onboard and groups are variable and get together for different shore excursions or deck activities. We have fond memories of our time aboard the Vela and in today&apos;s age of speed and instant communication, the Vela offers a slower pace. It is a week away from wifi and &apos;the real world&apos; but the truth is one can usually find wifi in the beach bars along the islands. But don&apos;t sit there for too long checking messages and emails - you&apos;ll miss out on the island&apos;s offerings. 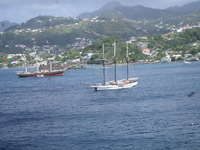 Traveling to Marigot Bay (Embarkation Port): This in itself was an adventure. We flew from Boston via Miami to St. Lucia. The main airport is in the south east corner of the island, but Marigot Bay (Cappella) is in the north west part of the island. We had hired a taxi/driver in advance of arriving and the hour plus long ride was not for the faint-hearted. Tail-gating, windy roads, unattended brush fires along the side (!!! ), going from shore line into and across the mountain region through rainforest type areas, goats and stray dogs can all be seen along the way. I had to just trust that our driver had it all under control, but as a well-practiced backseat driver this was not easy. The Vela was leaving on Sunday, January 3rd and we arrived at Marigot Bay on January 1 as we did not want to risk missing her departure due to cancelled flights or bad New England weather. We stayed in the Marigot Bay Beach Resort for those two nights and be prepared for this very expensive area. We arrived by taxi at the end of the road and a launch boat took us (and our luggage) the rest of the way to the hotel area. Yes, there was no road to the hotel! The restaurant by the hotel is Doolittle&apos;s but one could also take the hotel launches back to the road&apos;s end. There is a small supermarket there which also serves the yachts and sailboats which arrive here. Several small (and quite good) restaurants can be found within walking distance. Eastern Caribbean Dollars are used here, and unlike other areas of the Caribbean we found that US dollars weren&apos;t really accepted. Meals and groceries were not cheap. There is a small beach and some hiking trails in this bay and one can enjoy watching the constant traffic of sailing vessels and a few yachts. One can get good wifi at the bayfront cafes. The wifi at the hotel was sketchy but did the trick. Bring adapters for your electronic devices as St. Lucia is not compatible with USA plugs. There are also some other towns close-by to the embarkation port where one can stay and then take a taxi the morning of the departure date (Rodney Bay or some near-by luxury resorts). Cabins: The Vela is a sailing ship and this means that she is not very wide which means, in turn, that cabins are smaller in the bow area (where we were) and somewhat broader in the stern. Our 20 year old son stayed in cabin 1 which is for one person with an &apos;all-in-one&apos; ensuite bathroom. My husband and I had cabin 3 which was slightly larger than cabin 1, but not by much. There is enough room for one person to stand and get dressed. The other would have to stay in bed or wait outside! However, we were onboard for the outdoor fun and we quickly adjusted to the limitations of our cabin. The bunks (a single bunk on top with the porthole and a slightly wider one at regular bed height below) were comfortable and cozy with lovely beach-themed accent pillows. Luckily we had packed light and plenty of hooks were provided for hanging clothing and other necessities. I understand that in the mean time other storage options have been installed. I had been skeptical about the "all-in-one" shower situation which means one showers over the toilet and sink but it actually worked out quite well. One draws a shower curtain across the bathroom door and it&apos;s like one is in a shower cubicle. Towels hang on the door on hooks behind the curtain and they didn&apos;t get wet. Shampoo and soap are provided in dispensers attached to the wall and I was glad to see that the waste of single bottles had been eliminated. The cabin&apos;s cooling unit kept it from feeling stuffy or hot. The beds were made without fail and the cabins kept clean by the daily visit by the stewards. Bath towels are provided, as well as hand towels. The boat was great and so is the company! Wonderful ship, amazing staff, new friends!